More Big Photos from this year's race and Here is the complete index of photos from T-A 2009 ( ). tv schedule RAI Sport highlights and interviews. Live some coverage as well. tv schedule (see comments) United States, Canada and surrounding US territories? 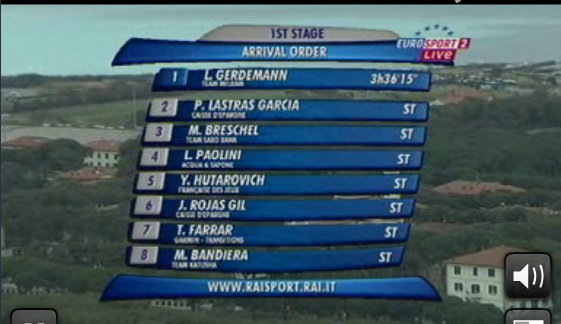 ; Live video streaming/online 9:30 AM ET for Stages 1-3, 10AM or 10:30AM for other stages. TV delayed broadcast: 3 PM ET and 6 PM ET. Universal Sports TV Channel. Find Universal Sports TV in your area. Astana's Enrico Gasparotto was caught at the top of the wall with 1 km to go. 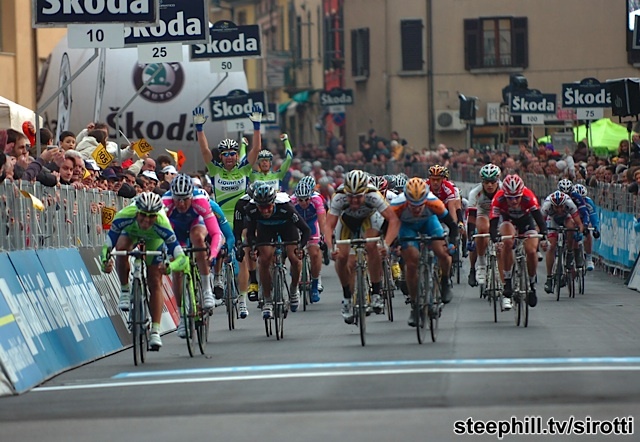 A four man bunch sprint ensued which he won. Interactive map and profile of the finish (interactive map not updated for the route change; finish is the same). Interactive map and profile of the finish. 1  Daniele Bennati (Liquigas)       3h54'09"
1  Daniele Bennati (Liquigas)      11h44'23"
2  Linus Gerdemann (Milram)              04"
3  Tom Boonen (Quick Step)               04"
March 11 update: Stage 3 takes place in the same area as Stage 2. 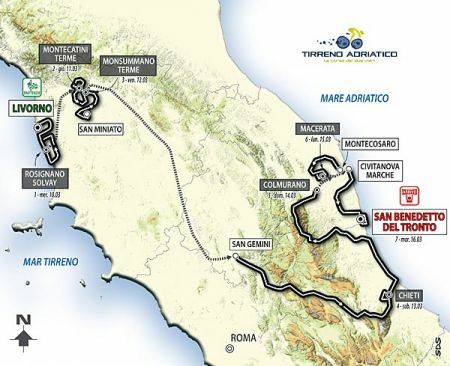 There will be a figure eight around Monsummano Terme before a flat finish. This seems like another sprinter's stage but there are a couple good bumps towards the finish so a break could survive to the finish. 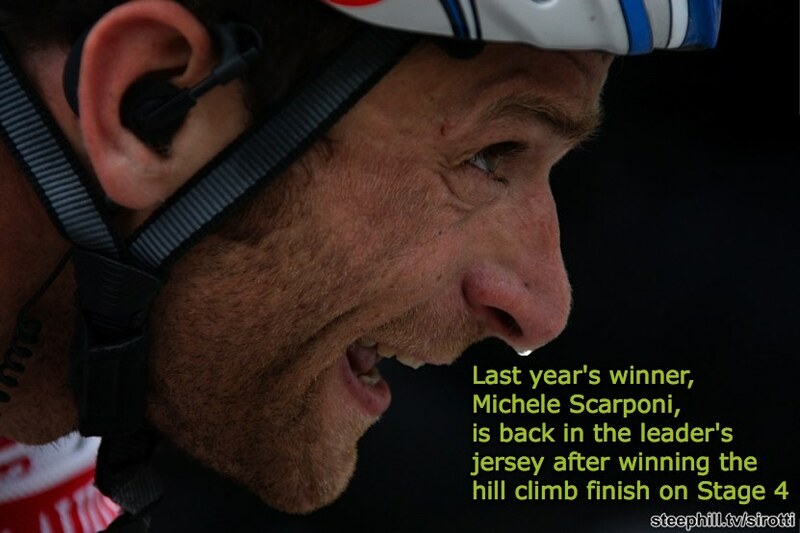 ... read more of the Stage 3 Preview (more stage previews are in the works). 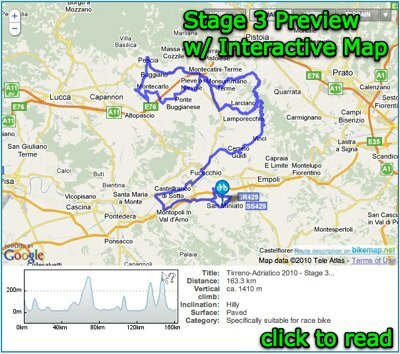 March 10 update: This is the second stage in Tuscany and we moved north to the area between Lucca and Pistoia. The first part of this stage heads south to the flats of Fucecchio just west of Florence. We then return to Montecatini Terme and continue north to a wooded region where the stage peaks with a steep 762m climb at Goraiolo. The roads in this area are really windy so the combination of a decent climb and twisty roads will shatter the peloton. But there is still 80 km to go at this point. 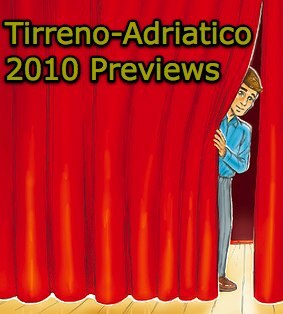 ... read more of the Stage 2 Preview (more stage previews are in the works). 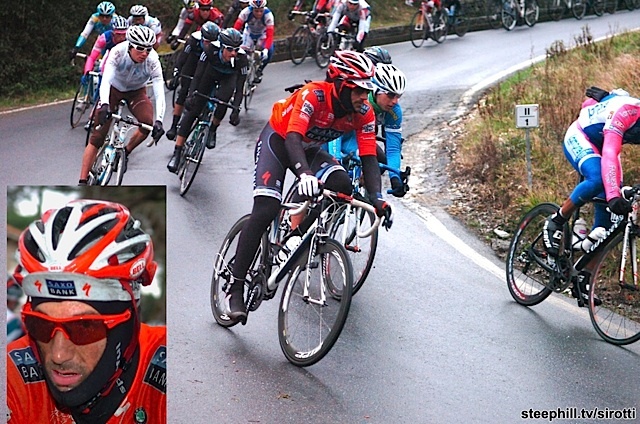 March 9 update: Stage 1 features the flat route heading south along the Tyrrhenian Sea in Tuscany. 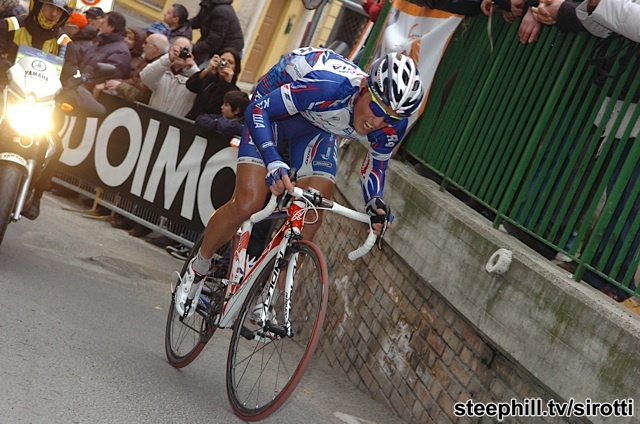 There will be a few small hills (bumps) as the peloton loops inland around the finishing town of Rosignano Solvay. There is a small hill in the last 8 km but we should see a sprint finish over the last few flat kms among some of the best sprinters in the business. But the roads are windy so a break could succeed. Factoring in a windchill around 40F and a 30% chance of rain and it could be a more difficult day that otherwise expected. Also, see the route announcement and stage and interactive maps, profiles and google earth files (preview links) in the race summary table (right). March 9 update: Some of the many big names that will take the start tomorrow (Wednesday) L-to-R: Daniele Bennati, Fabian Cancellara, Franco Pellizotti, Vincenzo Nibali, Andy Schleck and Mark Cavendish. 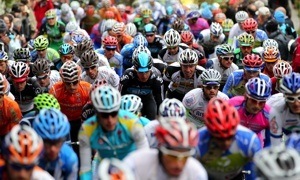 This race is rapidly growing in popularity among the riders as an alternative to the bad weather and mountains of Paris-Nice. 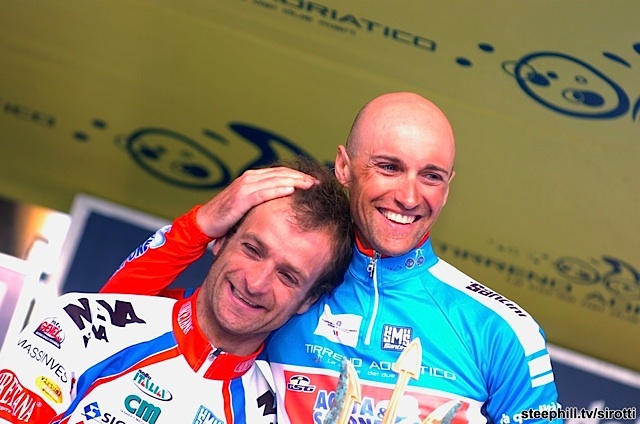 The race is also becoming very popular among bike racing fans worldwide as it's the first big showdown of the best sprinters and a gauge for the upcoming Spring Classics. 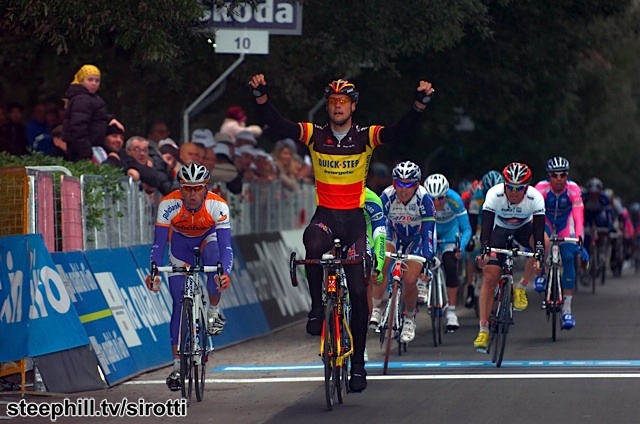 In North American, Tirreno-Adriatico will be televised daily on Universal Sports. 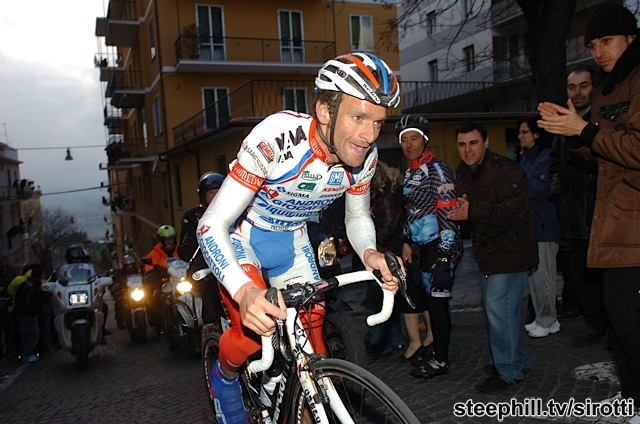 The 2010 Tirreno-Adriatico will be dedicated to the memory of Franco Ballerini, the director of Italian cycling, who recently died in rally car accident.